A very useful Adapter when space is limited at the back of Your Sky or Virgin Box. The Adapter is Rohs Compliant for the Highest Material Standard in the EU. Connector A: F Male. Connector B: F Male. 1 x F Socket to Male Coax. 1 x F Socket to Female Coax. Ideal for use with things like sky, aerials, magic eyes etc. Auline Connectors / Adaptors. Handy adapter to convert the connection type from an F Type to TV aerial coaxial, Ideal to run from an Aerial distribution or Aerial amplifier F-type into standard aerial socket. 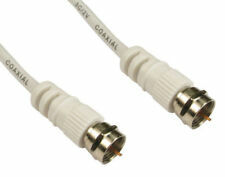 TV Aerial Adapter - TV Coaxial To F Adapter. Auline Connectors / Adaptors. 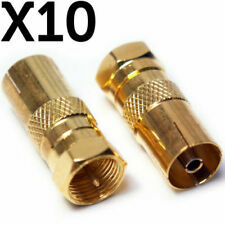 Female Coax Socket to F Connector Plug Adaptor. Used to convert a male coax socket, to an F Plug. Length: 1m. F Plug Male to F Plug Male Cable. • Screening >110dB for maximum signal reception. • Superior grade 99,996% Oxygen Free Copper conductors, for lowest possible signal loss. • Superior flexible outer cable jacket, to avoid cable twisting and cable fracture. Coax F Screw Plug to Plug. 75 ohm Cable with Screw on Connectors. BLACK SKY / VIRGIN CABLE. SKY SAT, VIRGIN, FREEVIEW BOX, BLADE, VU . 1 x F Type Plug to 1 x F Type Plug. 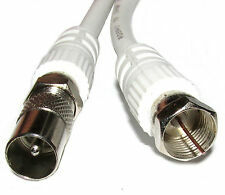 Male coaxial plug. Ideal for connecting to TV's flush up against a wall. to see our full range of Audio Connectors. Coaxial Plugs. 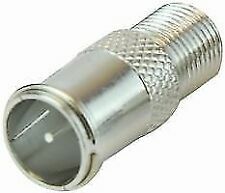 A male F connector is prodomindently used for attaching to 'standard 75 ohm coaxial cable', thus enabling the cable to be plugged into a device. How to use -The outer shell of the connector can be unscrewed where there is an internal pin, this allows you to attach the centre core of your cable with solder. 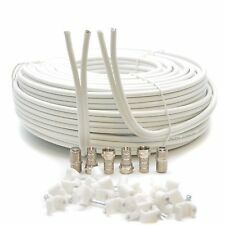 These cables are suitable for many applications including Sky Digital, Freeview, Cable Modems and any other device using this type of connection. 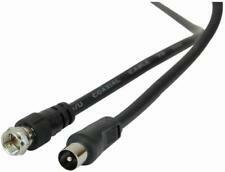 CAI APPROVED DIGITAL CABLE. Fully Screened CAI Approved Digital coaxial cable with Foam Dielectric, Copper shielding, Copper braiding and Copper centre core. 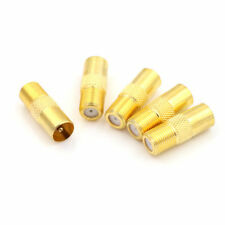 Gold Tone Plated Alloy Female F to Male TV Aerial Plug Adapter. Type: RF Male to "F" Female Great for TV antenna connecting use.